WindEnergy Hamburg, which ended on Friday afternoon, has further strengthened its position as the most important platform of the global wind industry, the past four days have demonstrated convincingly. Many of the 1,482 exhibitors from 40 different countries at the world’s leading expo of the onshore and offshore wind industry announced product launches and business transactions. International interest in the industry event has increased further: The share of international exhibitors grown to more than 50per cent (as compared to 44per cent in 2016). All key players of the entire value chain were present in the fully-booked exhibition halls, including 16 wind turbine manufacturers from Europe, the Americas, and Asia. The featured topics of this year’s flagship fair included Dynamic Markets, Cost Effectiveness, and Smart Energy, putting the spotlight on current developments in the globally expanding wind industry. All in all, WindEnergy Hamburg was attended by 35,000 industry visitors from 100 countries (as in 2016); the share of international visitors grew to 45per cent. "WindEnergy Hamburg is the only global industry event of the wind energy sector," stated Bernd Aufderheide, President and CEO, Hamburg Messe und Congress. "As the energy transition unfolds around the world, and more and more wind markets exhibit dynamic growth, the interest in sharing knowledge and ideas and staying informed is stronger than ever. 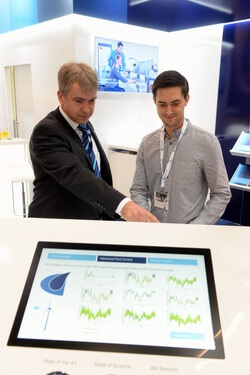 The world's leading wind industry expo offered the right opportunities at the right time – an innovative platform for sharing information, doing business and networking at the highest levels,” Aufderheide continued. "What became clear in the discussions with international industry visitors and exhibitors more than anything else was that the Global Wind Summit is considered a launchpad for further growth." In parallel with WindEnergy Hamburg, the global WindEurope conference was held at the Hamburg Messe fair site. Both events jointly formed the Global Wind Summit 2018. In a representative survey, 96per cent of industry visitors said expectations had been fully met. The most important reasons for attending this fair were to establish new business contacts, renew existing ones, and get information about new products and trends. 96per cent of visitors praised the excellent international networking opportunities, as well as the comprehensive overview of innovations and new developments in the wind industry they gained at the fair (97per cent). The presence of 40 national delegations from countries such as the United States or Pakistan, as well as energy ministers and other high-level representatives of many nations highlighted the significance of this knowledge-sharing event for the global wind markets. The comprehensive coverage of topics at the trade fair was commended by 97per cent of industry visitors. Exhibitors and industry associations agreed that the business climate was excellent at this trade fair, a statement confirmed by representatives of the 23 national and regional pavilions at the event. Are you looking for this year's wind energy events? Go visit WindEvents.Com and you'll find them all in one site. You can comfortably organize your personal schedule in your account and share it with others using the ical function. It's easy and free! Greece: A Paradise for Floating Wind? The Greek government's announcement to massively expand renewable energies in the country in the coming years is arousing desire. Now Norwegian Equinor Group is taking a stand: Greece is an ideal location for floating wind turbines.